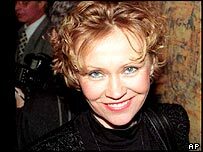 Abba singer Agnetha Faeltskog has signed a new record deal that will lead to her first album in 17 years. Warner Scandinavia said it would be releasing the 53-year-old singer's album My Colouring Book around the world in the spring. It described the album as an acoustic record featuring an orchestra and band leader Anders Neglin. Faeltskog was one of the founder members of Swedish group Abba, who sold millions of albums in 70s and 80s. Faeltskog has led a reclusive life since releasing the 1987 album I Stand Alone. She lives on a secluded island outside of Stockholm. Work on the new album began three years ago, but work came to a halt when sound engineer Michael Tretow suffered a stroke. The first single from the album will be the song If I Thought You'd Ever Change Your Mind, which was composed by John Cameron. Abba - Faeltskog, Annifrid Lyngstad, Bjorn Ulvaeus and Benny Andersson - sprang to fame in 1974 when they won the Eurovision Song Contest with their first hit single Waterloo. They had nine UK number ones between 1974 and 1982. The group sold more than 350 million albums around the world, including many millions after they split in the early 1980s.